People march in the annual parade down Martin Luther King Jr. Boulevard to honor Dr. Martin Luther King in this 2015 photo. Across Chattanooga, volunteers used Monday's Martin Luther King Jr. Day holiday to give back in the spirit of the civil rights leader. Nonprofit Causeway sponsored a "Cause Mob" that sent volunteers to a secret location and, at the Salvation Army on McCallie Avenue, Southern Adventist University students made rows of hangers and boxes of donated clothing into a fully functioning store for area homeless, complete with a personal shopper. Adventist senior Ana Fuentes, who organized the Salvation Army event, said it celebrated King's spirit of service. "They don't really get a dignified shopping experience, so I guess looking them in the face, asking them what their name is, shaking their hands, hugging them is a way of serving them and showing Christ's love as well," Fuentes said. Fuentes and about 50 other students worked as personal shoppers, guiding people past clothes, accessories and shoes hung on the metal fence surrounding the property. They helped them pick out clothes that fit their needs, then the shoppers went through a "checkout line" and were guided inside for a hot meal and coffee. "I was gonna stay at home, and it gave me a reason to come out and do something," said Terrence Bostick, 35. He was hoping to find a new pair of jeans. "I think it really helps the people who don't have anything to do feel like they're part of the whole community," he said. 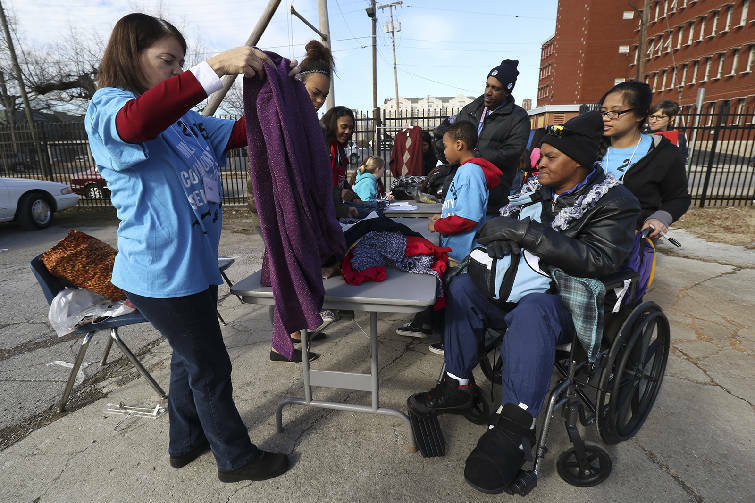 Marggie Pittman, left, folds and bags clothes for Sharon Garner during a "Street Store" event run by Southern Adventist University and Salvation Army volunteers offering free clothes and lunches for the homeless as a Martin Luther King Day service project on Monday. Salvation Army Director of Marketing and Development Kimberly George said the push to use the holiday as a chance for service has grown in recent years. "I think it's wonderful that the students are realizing that the world is bigger than just their university," George said. Other area events focused on occupying children who were out of school for the holiday. The nonprofit TechTown Chattanooga sponsored a free technology pop-up for kids at the Bessie Smith Cultural Center on Monday afternoon. Youngsters made circuits out of brackets and paper clips and waved excitedly in front of a green screen. 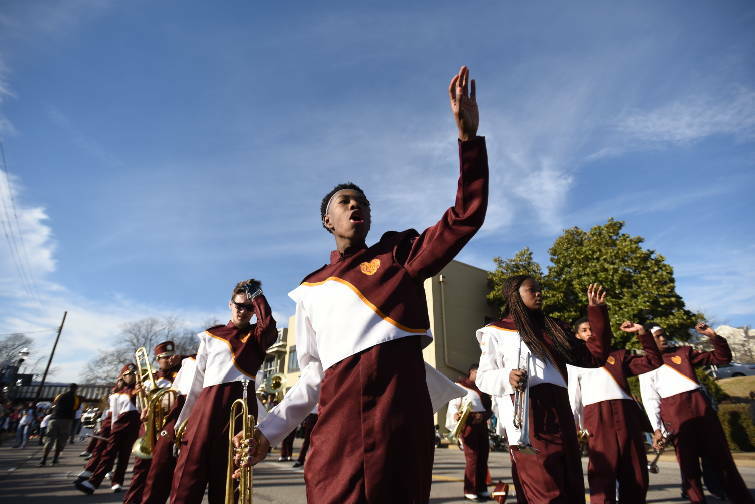 Ladarius Truss performs with the Tyner Band in the annual parade to honor Dr. Martin Luther King. TechTown Chattanooga Executive Director Chad Bullard said the event fit the spirit of M.L. King Day because it focused on giving everyone a chance to explore their passions in technology, regardless of socioeconomic, gender or racial barriers. "This is just to show that the spirit of TechTown is that drive for digital equality," Bullard said. "It's really an access piece to make sure everyone is able to learn and grow." Tabitha Boatswain found the TechTown event when she was searching for activities to do with her 12-year-old daughter, Gabrielle. Though the day wasn't focused on community service, Boatswain said she still thinks it honored King's spirit. "It doesn't have to be just focused on the symbolism of Martin Luther King, but the end result is everybody is out together," Boatswain said. Contact staff writer Claire Wiseman at cwiseman@timesfreepress.com or follow her on Twitter @clairelwiseman.